Martin Yale 2000SC/2000CC Shredder - Roberts Business Machines, Inc. The Martin Yale 2000SC/2000CC Shredder is designed for 1 to 3 users in the office. Besides shredding paper, it can also shred CD’s and credit cards. No need to remove staples or paperclips, this shredder takes them in stride. 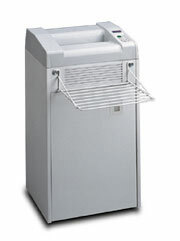 Purchased as either a Strip Cut (SC) or as a Cross Cut (CC), this versatile shredder is a great addition to your office.